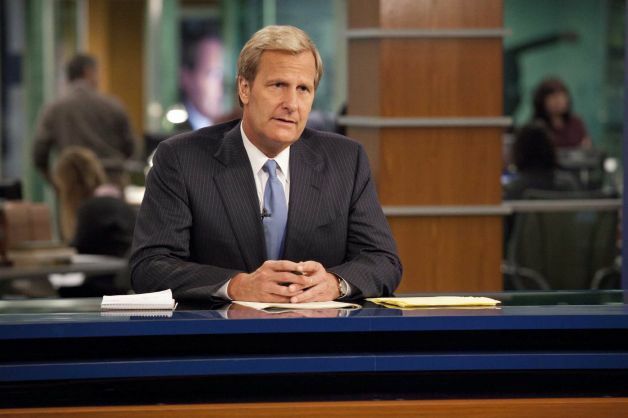 Recently, several friends have asked me what I think of Aaron Sorkin’s new show The Newsroom. For the uninitiated, Newsroom’s main character is Will McAvoy, a cable news anchor intended to be a right-of-center Keith Olbermann. After a public meltdown/epiphany, McAvoy decides it’s time to stand up for an honest, good old-fashioned Cronkite-an newscast interested in getting the facts right and uninterested in ratings. Sorkin offers a highly romanticized view of TV news from the 1950’s through the 70’s; beyond that, I find the show to be mostly preachy and boring. My criticisms of the show aren’t particularly original; you can find plenty of others saying basically the same thing. However, I would like to say something positive about the show that I haven’t seen elsewhere: the basic argument it makes offers a great opportunity to explore the typically overlooked Catholic teaching on social communications. McAvoy’s quest to do a better newscast highlights several concerns raised in Vatican teachings on the role of news and information in the media. Prior to Pope Pius XI’s 1936 encyclical Vigilanti Cura, there is little attention on the area of social communications by the Catholic hierarchy. Written shortly after the advent of “talkie” films, its concern with the cinema is on the potential for questionable content that might imperil the moral lives of viewers. It thus largely calls for means of policing such content through pressuring the film industry to make better movies and discouraging the faithful from seeing bad ones. Another encyclical, Miranda Prorsus, was released by Pius XII in 1957. Taking a different tack from its predecessor, this encyclical more fully recognizes the wonders of modern communications and the fact that these forms can – and indeed should – be used to spread the gospel. The means of social communications are gifts from God that can be used for good or for ill, thus there is a moral imperative to form a good conscience and good habits with regard to media use. Social communications achieved conciliar recognition during the Second Vatican Council with its Decree on Social Communications, Inter Mirifica. When not ignored completely, this document is often maligned as ineffective or without any major content. Nonetheless, the very fact that an ecumenical council gave such prominent recognition to the significance of the media bears symbolic importance. Moreover, its concern for the formation of the faithful in light of the changing nature of social communications led to the most important document in this tradition, Communio et Progressio. Communio et Progressio makes a distinction between communicators and recipients. Recipients are “those who…read, listen to, or view the various media,” while communicators are “those who actively employ the media” in the sense of producing and disseminating media (15). This distinction is not actually between persons (paragraph 187 recognizes that all the people of God are fundamentally both), but between roles within the media. The roles for communicators are varied, including actors, writers, directors, producers, and, in this context, journalists. Second, Communio et Progressio recognizes that the news coverage will always be selective, meaning that communicators must make decisions about what to cover and how much to do so. They must, “out of a mass of material…select what they judge to be the significant facts that will concern their audience” (37). The risk of this is that on occasion the news will cover topics that are not “of real importance.” On The Newsroom’s fourth episode, McAvoy goes on “a mission to civilize,” taking a gossip columnist to task over her assumption that she and he do the same thing. She is in the process of doing a “takedown story” on a reality show star, to which he replies that he would have more respect for her if she were a drug dealer. The claim here is that focusing news efforts on issues of no importance, particularly on the (relative) privacy of someone’s life, lowers the bar for public discourse. To McAvoy, it’s not even news. Third, Catholic teaching on social communications highlights the problematic tension of speed and accuracy in reporting. “Those who have to keep the public informed must give the news quickly if it is to appear fresh and interesting. Competition also obliges them to do this, and speed is often won at the price of accuracy” (39). The fourth episode includes coverage of the shooting of Congresswoman Gabrielle Giffords. As many will recall during the immediate aftermath of that tragedy, there was confusion about her condition, with many news outlets incorrectly claiming she had died. The show depicts the pressure to be on top of whatever is happening, with the president of McAvoy’s network yelling at him during the broadcast “Every second you’re not current, a thousand people change the channel.” The show, with the benefit of hindsight, shows McAvoy resisting the demands to claim Giffords was dead, which viewers know was the correct call. During McAvoy’s on-air apology about his own performance as an anchor, he refers to his own “hyped up terror scares” and “ginned up controversies.” He attributes this to “taking a dive for the ratings.” McAvoy suggests that the government’s failure to demand that the daily hour of news be free of advertising make the drive toward sensationalizing the news as inevitable. Lurid news delivers viewers, increasing the ratings and thus the ad rates. While there are problems with the logic of McAvoy’s arguments, he nonetheless thinks that greater attention the facts and to what is “newsworthy” will mitigate against the temptation to sensationalism. This is not to suggest that Sorkin was looking towards the documents of the Pontifical Council for Social Communications when he was creating his show. Rather, I think that the attention the show has received, even despite its romanticism, provides an opportunity to revisit an ignored but increasingly important tradition of Catholic teaching. James Caccamo notes that social communication is “essentially absent from the scholarship and teaching on Catholic Social Teaching in the English speaking world.” Given the massive influence of mass media in our contemporary culture, renewed attention on this area is surely called for. If anything positive can come out of Sorkin’s newest foray into mass media, I hope it is such attention.